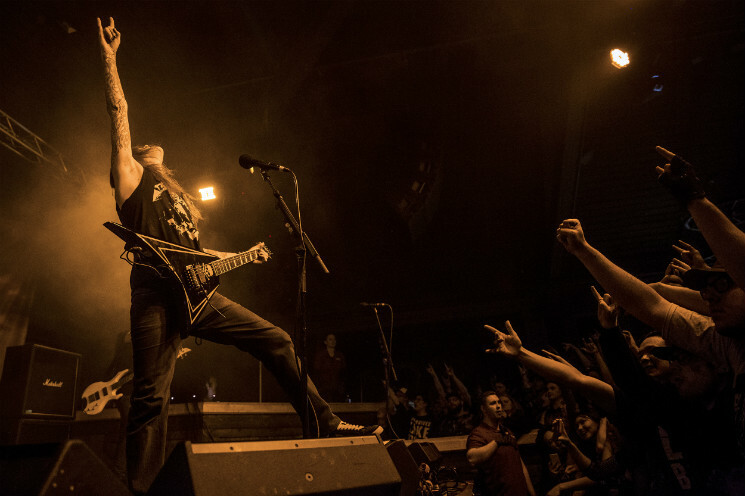 Finland's most notorious shredders, Children of Bodom, brought their "Down and Dirty" tour to Edmonton's Ranch Roadhouse to celebrate 20 years together by throwing down and melting faces for another memorable night on Saturday (November 11). Despite losing longtime member Roope Latvala last year, Children of Bodom are still a force to be reckoned with, and made that known upon unleashing their extreme metal in Edmonton. Kicking off the mixed bag of metal music for the evening, New York's Uncured delivered intricate musicianship featuring the likes of seven- and eight-string guitars, with technicality leading the charge in their performance. Second up, and playing their first-ever Edmonton show were Finland's Lost Society, who took their audience back in time to the '80s thrash takeover. Their blistering riffs, impressive speed and bang-your-head beats had the whole floor singing along and thrashing about with an endless sea of hair in the air. Playing direct support, Carach Angren of the Netherlands were extremely unique and captivating. The horror-inspired black metal group aroused interest amongst concertgoers by putting full commitment into their stage personas, conveying a spooky mood throughout their performance that translated well to the Edmonton audience. Last but certainly not least, Children of Bodom took to the stage. The stage banner displayed the band's album cover for 1997's Something Wild, which seemed to make the featured grim reaper glow under the stage lights, resulting in a rising buzz of anticipation for what was soon to come. Starting the set strong right off the bat with "Dead Night Warrior," the whole room immediately exploded into a frenzy of headbanging and cyclone moshing, which only amplified when the band followed up with the sonic savagery of "In the Shadows" and "Needled 24/7." Frontman and guitar virtuoso Alexi Laiho nailed his parts with precision, further proving his title as a modern day guitar hero. His talents especially shone through during deep tracks "Bed of Razors" and "Kissing the Shadows," as he dominated his solos with intricacy and effortlessness. The energy in the room didn't falter throughout the set; from the moment the band hit the stage to nearing an hour into the set, the Ranch was a storm that craved more and more of what Children of Bodom had to offer. With a setlist that consisted mainly of older tracks, the crowd were more than satisfied, and could be heard expressing their content with the show upon leaving the venue. Despite being in the game for 20 years, and with more still to come, Children of Bodom are still on top of their game.